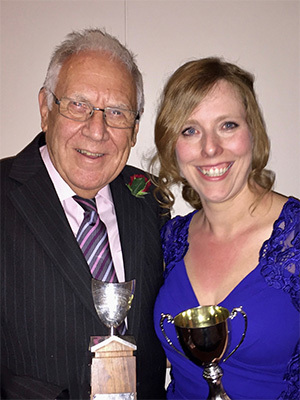 News from BONOSLatest news and updates..
Another great night at NANDA’s Play of the Year Awards Dinner with Howard Whitehurst, Director of the Year, and Anna Hodkin, Set Design, picking up awards for ‘Move Over Mrs Markham’. Phil Chapman also got a Special Mention for Best Supporting Actor. Our other entry, 'Murder on the Nile', got Special Mentions for Anna Hodkin, Director, Tony Tomlinson, Best Actor, Phil Chapman, Best Supporting Actor, Val Terry, Best Supporting Actress, and Best Set Design, Tony Tomlinson. Another successful night at the annual awards ceremony. Our production of Brief Encounter scooped four awards - Best Director for Anna Hodkin, Best Supporting Actress for Jo Thomas, Best Newcomer for Lauren Hodkin and Best Technical Presentation for David Goatham. 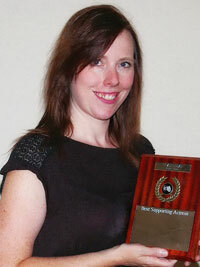 In the picture, Anna is shown holding Jo’s award as, sadly for us, Jo has left the area for pastures new in Cumbria. Another great night at the NANDA Play of the Year awards with Anna Hodkin winning Best Supporting Actress in Sitting Pretty. 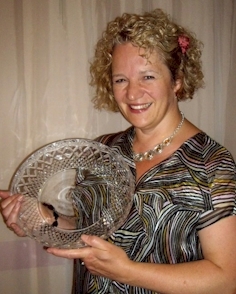 Photo shows Anna with the brand new trophy. We are pleased to announce the details of our forthcoming 2015-2016 season. We begin with Jeffrey Archer’s courtroom drama “Beyond Reasonable Doubt” which originally starred Wendy Craig and Frank Finley. 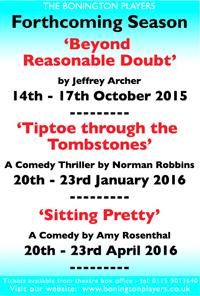 The new year opens with “Tiptoe through the Tombstones” a comedy thriller by Norman Robbins, followed by the dramatic comedy “Sitting Pretty” by Amy Rosenthal and which originally starred her mother Maureen Lipman. 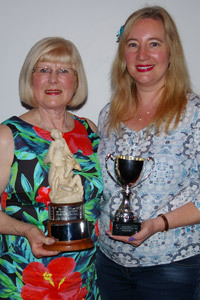 Successful night again at the NANDA Awards Dinner with trophies for Best Set Design, Kerry Williams, and Best Costumes, Christine Chapman, for “Blackadder Goes Forth". July 2014: Forthcoming 2014-2015 season. We are pleased to announce the details of our forthcoming 2014-2015 season. We begin with three episodes of the brilliant BBC comedy series "Blackadder Goes Forth" by Richard Curtis and Ben Elton. 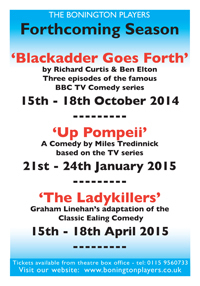 In the new year we will be presenting the famous TV comedy "Up Pompeii" by Miles Tredinnick and we will close with a staging of the classic Ealing comedy by Grahan Linehan"The Ladykillers". Another great night at the NANDA Awards Dinner with trophies for Producer of the Year, Anna Hodkin for "The Rivals", Actress of the Year, Abi Hemmings jointly with Zoe Lander (who wasn't there!) for "The Memory of Water", and Best Set Design, Howard Whitehurst and his team for "Gaslight". 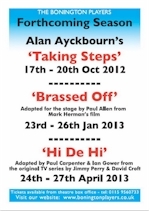 August 2013: Forthcoming 2013-2014 season. 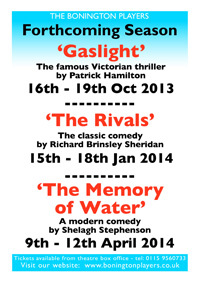 We are pleased to announce the details of our forthcoming 2013-2014 season. We begin with the famous Victorian thriller “Gaslight” by Patrick Hamilton. In the new year we will be presenting the classic comedy “The Rivals” by John Brinsley Sheridan and we will close with a modern comedy by Shelagh Stephenson “The Memory of Water”. 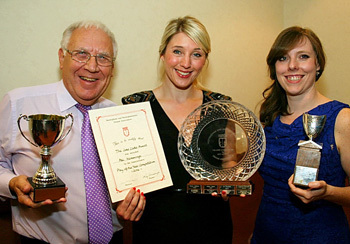 Another great night at the NANDA Play of the Year awards last week with the Bonos winning two trophies. A fantastic way to round off our 50th season. Congratulations to everyone. Great night at the NANDA Play of the Year awards last week with the Bonos winning three trophies. At the NANDA Play of the Year Awards last week, Vic Roberts picked up the Harry Penson Trophy for Actor of the Year for his portrayal of Willy Loman in Arthur Miller's "Death of a Salesman". He is pictured, left, with director of the play, Howard Whitehurst. - Very well deserved Vic. 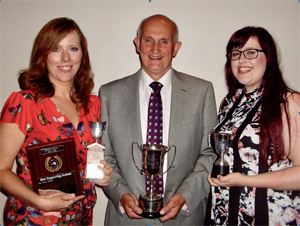 Congratulations everyone for another successful NANDA awards night - adjudicator's special award for Katherine Howard, best set design for Fawlty Towers and honourable acting mentions for Adam Guest (Manuel in Fawlty Towers) and Anna Hodkin (Katherine in Katherine Howard). Well done. Bono actor takes prize at NANDA One Act Play Festival. Adam Guest scooped the Best Supporting Actor prize at this year's NANDA One Act Play Festival for his role as Manuel in our production of Fawlty Towers. The Bonington Players took one of the episodes from their recent sell-out run of Fawlty Towers to the festival. 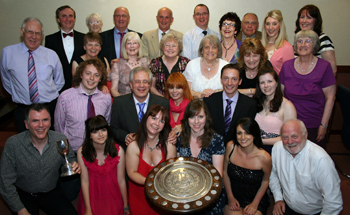 It was with great sadness that The Bonington Players recently announced the death of their President, John Edge. 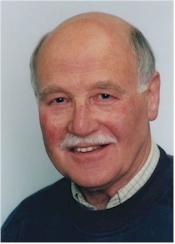 John joined the Bonington Players in 1973, appearing on stage in “Not Now Darling”. He was to go on to play many diverse roles in over fifty productions during the next thirty years or so. These included Ebenezer Scrooge, Professor Van Helsing, Archbishop Cranmer, sundry barons, squires and brokers’ men in pantomime and a selection of animals including Mr Badger in “The Wind in the Willows” and Owl in “Winnie the Pooh”. One role he was to play with great effect on three separate occasions was that of an ancient crumbling family butler, most recently in “Ring Round the Moon”. He was last on stage just three years ago in ”'Allo 'Allo” as the piano player in Cafe Rene. John was a talented scenic artist and set designer and produced numerous sets over the years, particularly period pieces which were his forte. He loved sourcing appropriate furniture and items of décor to ensure that he had the detail just right. John will be sadly missed.